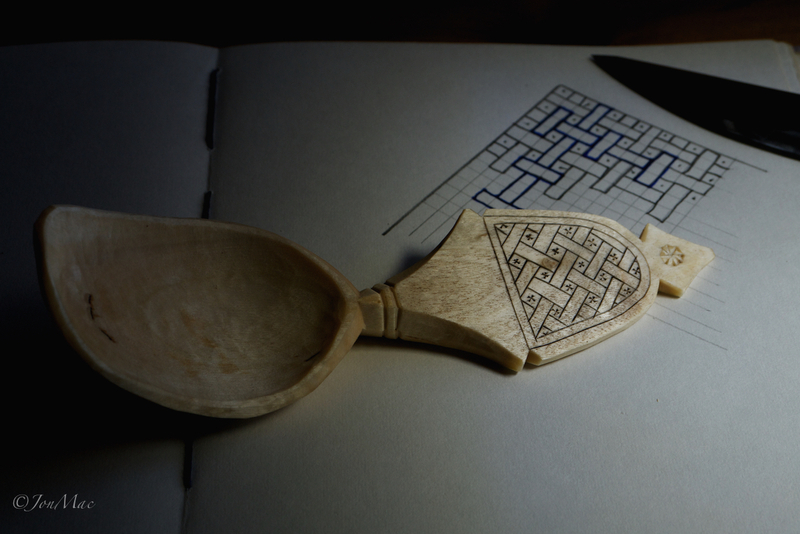 Kolrossing pattern for your hand carved spoon. 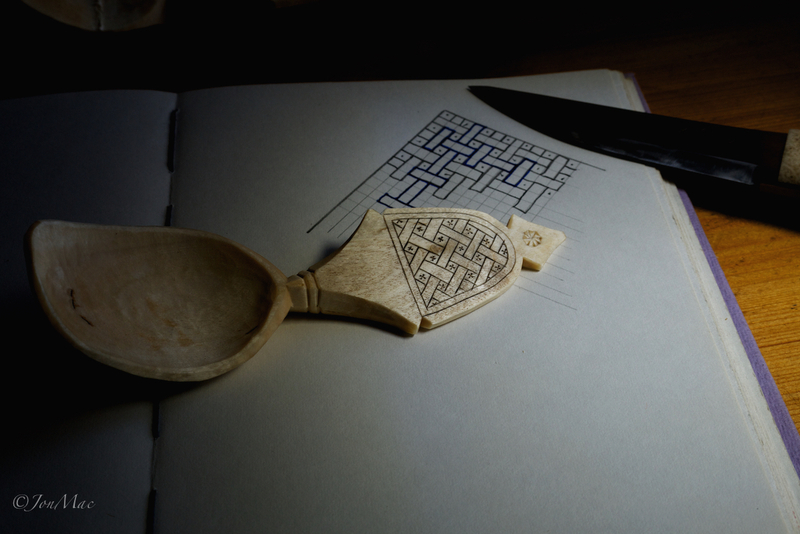 I've shied away from the Sami patterns that are quite common on Scandinavian/Nordic type spoons. However, today I succumbed - due in part I think to a curiosity about setting up the repeating pattern. I've seen a lot of this type of design, I took a look around the web today and could find no information as to how to set the whole thing up. The reason for the lack of information is undoubtedly down to looking in the wrong place. 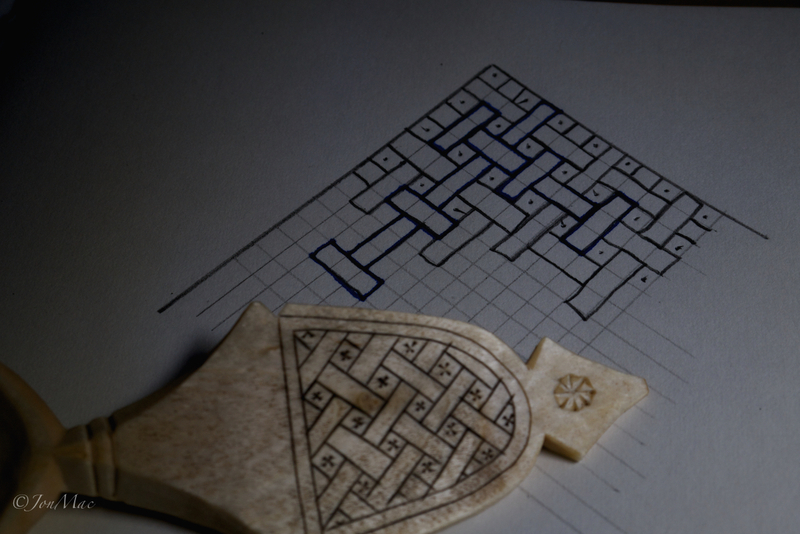 So, here is my own tutorial on how one might go about setting the pattern up. It's snowing out, the flu or whatever it is is making a comeback, so I've lit the fire and I'm working in the warm today. Apart from a wooden spoon, you'll need a super sharp knife, pencil, rule, fine Abrenet (optional) and some dry, finely ground coffee. 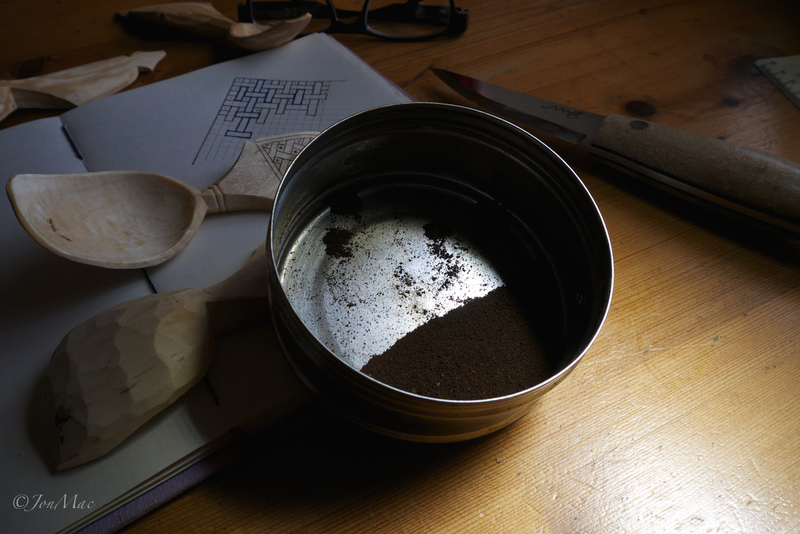 I selected a spoon that I've carved for a friend who is embarking on a cycle tour across Europe, commencing in the spring. All I need to do now is carve one for his lovely wife. Can't have arguments on the adventure eh ? 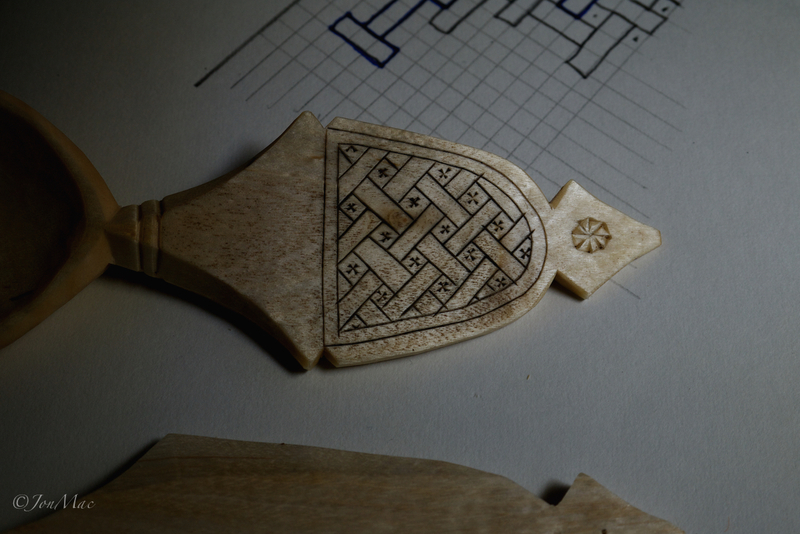 with your rule and pencil, make feint cross hatchings on the spoon. Then, with a heavier line, mark out the patten. I have highlighted the basic repeat in blue. Once finished, check the work to make sure there are no errors. 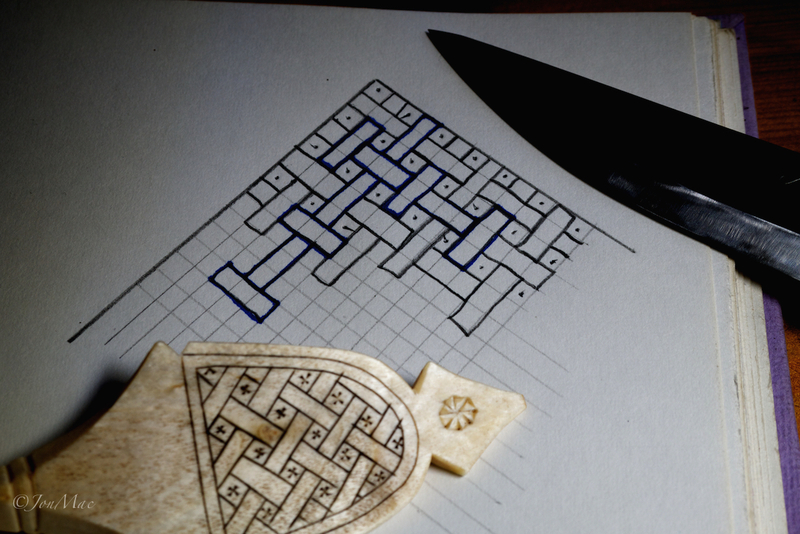 Once you are happy with your design, carefully cut along the heavier pencil lines. Just one slice, not too deep. 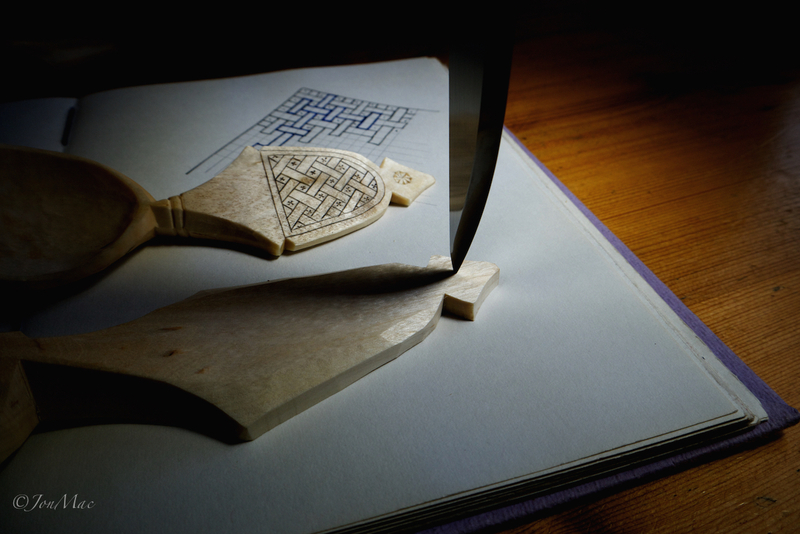 Once you are happy with your work so far and have been over the complete design, use the tip of your knife to make the Maltese cross shape. Simply poke in and remove. Or sharpen a fine nail to make a dot. Finally, rub some coffee grounds into the design with clean dry fingers. Wet or oily fingers will cause the fine cuts to close up. Clean the spoon with a clean cloth. to remove any raised fibres.